Russia has 185 strategic warheads more than limited by the New START agreement. That is nearly the number on-board the Northern fleet’s two Borei-class submarines. “Yury Dolgoruky” and “Vladimir Monomakh” can each carry 96 nuclear warheads if all 16 missiles are tipped with six warheads. In total, the two submarines can carry 192 warheads. The latest aggregate data released by the U.S. State Department tells that Russia by March 1st had 1,735 strategic nuclear warheads deployed. That is up 87 from the 1,648 reported by September 1st 2015. The figures do not reveal how many warheads are on board submarines, heavy bomb planes or in silo-based missiles. It is, however, likely that the increase in warheads mainly are on board submarines that sail out from the Northern fleet’s Gadzhievo base on the Kola Peninsula. In the last overview, with data from September 1st, the number of launchers were counted to be 526, while the number on March 1st were reduced to 521. It indicates that the 16 launchers on Russia’s newest Borei-class submarine, the “Vladimir Monomakh” were counted as launchers before September and have been armed with nuclear missiles sometime after September 1st last year. The New START agreement from 2011 says neither the United States nor Russia can have more than 1,550 strategic warheads when the treaty enters force in 2018. But instead of reducing, the latest figures shows that Russia continues to increase its number of nuclear weapons ready for launch. In the same half-year period, the United States reduced its number of strategic warheads by 57, from 1,538 to 1,481. The United States is by that within the limits to be fulfilled by 2018 as agreed on in the New START treaty. When the treaty was signed in 2011, Russia had 1,582 strategic warheads. 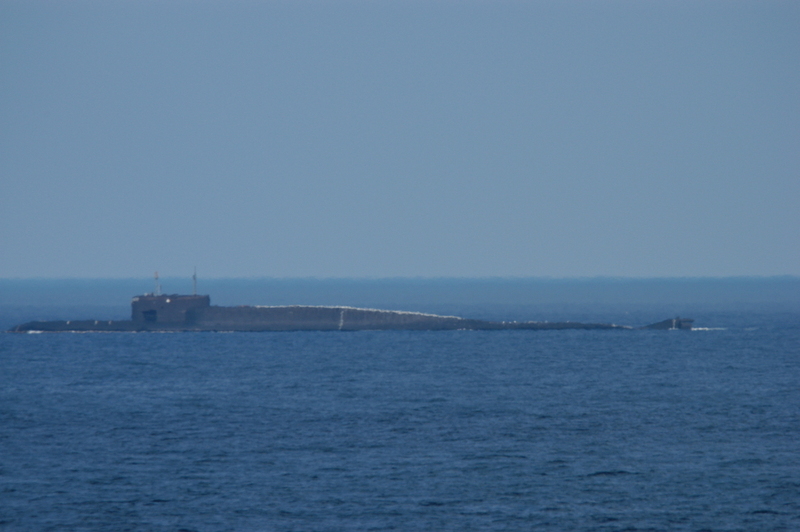 Russia’s Northern fleet has today eigth ballistic missile submarines sailing the Barents Sea. Six Delta-IV class and two Borei-class. The third Borei-class “Aleksandr Nevsky” was last year transferred to the Pacific fleet. Also “Vladimir Monomakh” will later this year sail across the Arctic Ocean and be based with the Pacific fleet. In addition, there are likely more missiles with warheads at storage in Okolnaya naval munition storage north of Severomorsk in the Kola bay. The New START treaty only counts strategic nuclear weapons. Tactical nuclear weapons are still surrounded by a lot of secrecy. Estimates vary, but experts believe Russia still has between 1,000 and 6,000 non-strategic nuclear weapons. The majority of these are in storages.